If you’re a writer who aspires to a measure of success—however you happen to define that—I’m sure you’ll encounter, if you haven’t already, some of the many discouraging moments in this endeavor. But if you’re looking for one of those moments that you can latch onto as proof positive that something went right, I highly recommend having someone read your work aloud, record it, and make it available via some broadcast medium. Particularly if this someone lines your work right alongside people like Vajra Chandrasekera and Cat Rambo and is herself Tina Connolly. Hearing the words “by Paul Hamilton” spoken aloud by someone not directly related to me was quite remarkable. I should also point out that I love Toasted Cake anyway, and not just because it features one of my stories. If you enjoy the kinds of things I write, you’ll most likely enjoy the podcast because I find myself liking the pieces on there at a far higher success rate than most other short fiction markets. I suspect that means Ms Connolly and I have similar or at least complimentary tastes in fiction, and it ought to mean you have a new podcast to subscribe to. It’s once a week, usually around ten minutes. Low commitment, high return. You’re welcome. It came about from a writing contest put on by Shock Totem in early fall of 2013. 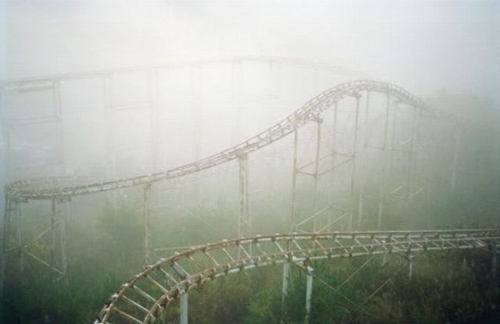 The contest was a visual writing prompt of a rusted roller coaster. This image, in fact. I didn’t win; don’t even think I cracked the top ten. But I did think there was possibly something to the slightly rough around the edges concept I cooked up. I was glad, for instance, that of all the entries I read (it was a peer-judged writing contest), it was among the few with a different kind of take on the prompt. In a way, the story was incredibly easy for me to write. I think of roller coasters and my lifelong love for them as kind of a core aspect of my personality. As far back as I remember I wanted to ride on the highest, scariest, fastest ones I could find. The strict adherence to the height requirements counts among my earliest remembered object lessons in in the general injustice of life. My bravery when it came to cautiously engineered thrill rides was part of what anchored me to some version of self-esteem as a kid. Because in truth, I was always and in some ways still remain a cautious, fearful kid. I’m a worrier by nature, and prone to allowing my imagination and its attendant dark side to get the best of me. But as with most people, I have dichotomies. One of mine is that despite being mostly terrified a lot of the time, I also have a certain boldness that is probably born out of a deep curiosity. I’m never not afraid to do something different or crazy or new, but typically I really want to know what it’s like, to know what I might be missing. And so my love of roller coasters was among the few tangible bits of self-identification as a kid that allowed me to believe I wasn’t utterly, hopelessly craven. The roller coaster in Corkscrew is based very heavily off of one of my nostalgic favorites, a ride at Great America in Santa Clara called The Demon. This was a ride that terrified my older cousins but that my unfettered enthusiasm for allowed me to bond with my dad (another roller coaster nut). When writing the story I replaced the largely unidentifiable track in the prompt image with my own mental recreation of The Demon and imagined a scenario where the track might be rusted, abandoned, overgrown. After I lost the contest I re-drafted the piece to expand it a bit beyond the strict 1,000 word limit for Shock Totem, mostly to flesh out the characters and the world just slightly because some early beta readers complained there wasn’t enough to anchor the characters to any emotion. The biggest change from the draft I submitted to the contest from the version that finally appears on the podcast is that Jen was the relative newbie and Ken was the experienced one. One bit of feedback suggested it would be more compelling if she was confident and capable and I thought that was really kind of the click that made the whole thing fall together. A side benefit of selling this to a podcast instead of a print market, and one that was completely unexpected, was how educational it was listening to someone else read my words in the way that made sense to them. I was able to hear little rhythmic tics in the prose I might have changed if I had suspected someone else with an entirely separate cadence was going to read it. It made me realize I rely a lot in my writing on translating in a direct fashion my own particular diction and style of speaking. Some of that is probably okay, maybe even good. It contributes to an individual’s voice. But too much of it means that if it’s read by anyone else, it’s likely to sound just slightly off. Trying to develop a rhythm that is a tad more universal might end up making my writing that much more accessible overall.